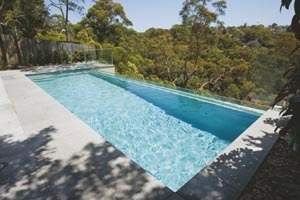 Despite offering its fair share of construction challenges, the beautiful surrounds of Pittwater provided an exceptional location for this pool. 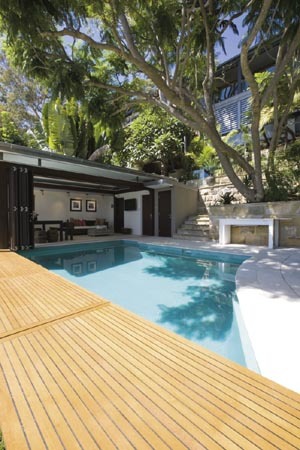 This opulent pool, approximately 4m x 6.5m, was constructed with major renovation works to the existing dwelling. 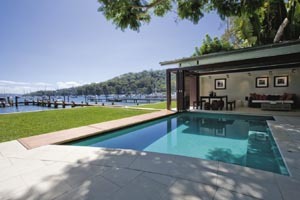 The pool’s design, incorporated with the lower entertaining area, offers an inviting, beautiful and functional outlook to the waterfront views of Pittwater. The interior has been fully lined in a striking light blue mosaic — an inviting contrast to the stone coping and timber finishes. 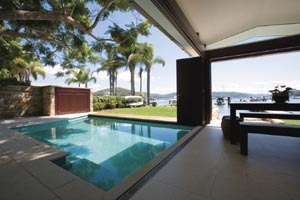 The pool’s design incorporates a long step area coupled with spa jets and swim jets for both relaxation and exercise. 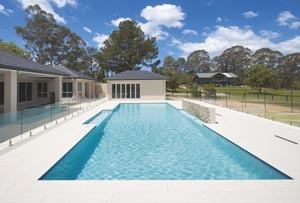 Gas heating is supplied on demand and there’s a complete security blanket custom-made to incorporate the pool’s unique design. The security blanket system retracts into its purpose-built tank, covered by a beautiful timber deck, which not only offers opulence but a practical approach to access. This site offered many challenges for the construction process, including limited space due to council restrictions as well as steep, limited access from the street, which required equipment and material to be taken to the site via a barge. The relative closeness to the water also created more challenges due to the tidal flow, which influenced the construction progress. 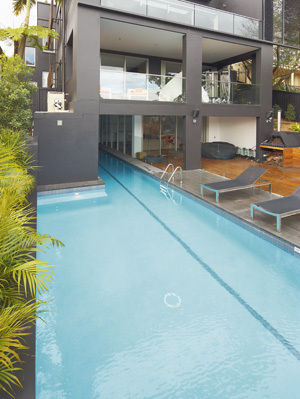 Sunrise Pools aims to design and construct — utilising the highest-quality materials and the latest technology — a complete concept that is unique, structurally sound and caters to the client’s needs. The company invests in staff through continual training and development, and ensures effective communication while offering a level of customer service that is second to none, from quotation to project completion. 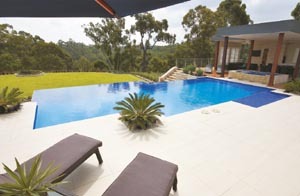 Sunrise Pools builds 50 to 100 pools each year in the Sydney metropolitan area. It is a member of the MBA (Master Builders Association), SPASA, HIA (Housing Industry Association) and APSP. Since it was started 34 years ago by Peter Moore, Sunrise has won more than 160 awards including the Hills Building & Design Award for pool/spa surrounds, MBA freeform or natural pool $50,001-$100,000, and was the MBA joint winner for traditional or geometric pool over $100,001. The company also received seven SPASA awards, all last year. 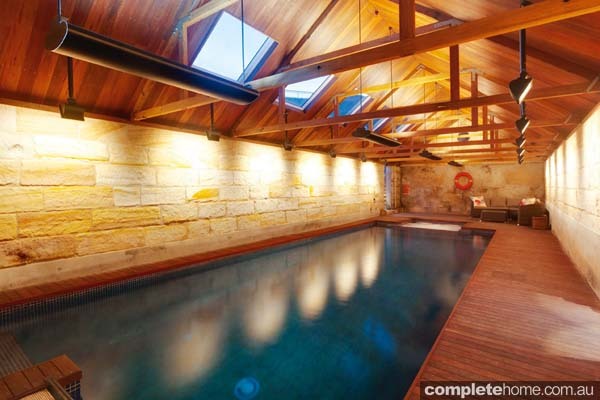 A derelict, heritage-listed boat house has been transformed into a unique indoor lap pool.